I like my Lumix DMC-TZ50 camera quite a bit. Though, the built in WiFi appears to be little more than a joke. I finally was inspired enough to poke around Panasonic's website to do something about it and here's the progress I made. I had a couple of good things happen with the camera. First, I was able to talk to a human about issues with the camera. She didn't have any suggestions for fixing the WiFi other than resetting the camera. Though, she did say I could continue working with her, and if the camera's WiFi is truly broken, they'll let me send it in to be repaired. Also, I stumbled on this marketing site for the camera which elaborates on a whole bunch of its features. Now that I've played with the camera a bit, it's probably a good idea to go back and review all these features to see if I should be using other options on it. Finally, I not only found the firmware update for the camera, but I found the instructions for applying it. Though the instructions for checking the firmware are different (on the TZ5, you have to do a funky key combination, on the TZ50 you just hit the menu button, go to setup, and click on the show version menu), the actual steps for applying the Firmware worked great. With the new firmware in place, the WiFi seems just as unreliable as with the old firmware. But perhaps I need to fiddle with it some more? Though, with all this good news, there was one really sour note. 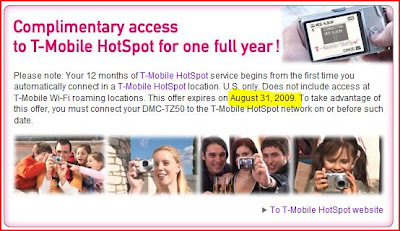 When I received the camera, I got a coupon that said I was eligible for one free year of T-mobile Hotspot. That's a significant offering, and would have effectively lowered the price of the camera $100. For the life of me, though, I haven't been able to redeem this offer. I've tried following the instructions given (which essentially say, use WiFi in a T-mobile hotspot location), but the camera never properly connects at T-mobile hotspot. I've talked to 4 or 5 t-mobile folks about it, and nobody has ever heard of this offer. Today, on my the tech support call, I learned why. Apparently, Panasonic canceled this offer back in January. The tech rep muttered something about how Starbucks switched from or to AT&T and that somehow invalidate this offer. When I explained to her that they were still advertising this offer on their own website, she was surprised, but said there was nothing she could do. I totally get that offers like this have to end early occasionally. And, I get that the box the camera came in was probably sealed up months ago and that it wouldn't be reasonable for Panasonic to have to recall it just to remove the free Hotspot certificate. But to continue to advertise the offer 8 months after it's expired seems like a really scummy thing to do. Luckily, I didn't make a buying decision based on this offer - but what if I had? At what point does Panasonic become guilty of bait-and-switch or false advertising?